Four adjustable tempered glass shelves. Two-way adjustable hinges with 107-degree opening capability for easy cabinet access. Fully-assembled medicine cabinet radiates simplistic style, with muted lines and beautiful wood accents. Behind its mirrored door is ample storage. Tucked inside its 31-inch x 25-inch, warm cinnamon frame are three fully adjustable shelves, for added functionality. Catalan 20-1/8 inch W X 36 inch H Aluminum Single-Door Surface-Mount Medicine Cabinet The Catalan medicine cabinet provides a stylish complement to any bathroom. Mirrors are positioned on the front and back of the door as well as the interior back wall of the cabinet. Four adjustable, black-tinted glass shelves hold your toiletries and bath items. Durable aluminum construction makes this cabinet rust- and rot-resistant. 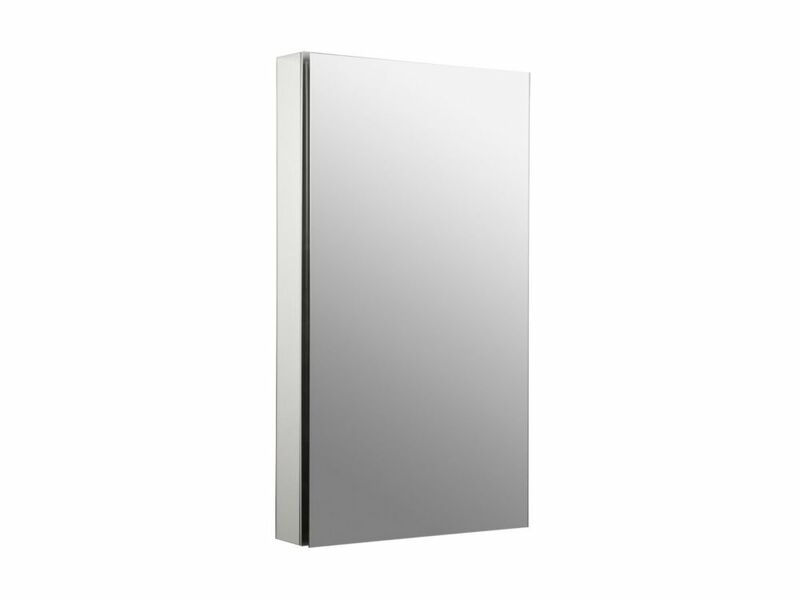 Catalan 20-1/8 inch W X 36 inch H Aluminum Single-Door Surface-Mount Medicine Cabinet is rated 4.4 out of 5 by 11. Rated 3 out of 5 by Andrew from Nice medecine cabinet, but the engineering behind the mounting hardware... Nice medecine cabinet, but the engineering behind the mounting hardware is terrible. For what it costs, I should have no problems and definitely not have to take mounting bracket to a welder to have extended. Rated 5 out of 5 by Jeff from Looks great in our updated master bath. Excellent quality... Looks great in our updated master bath. Excellent quality with lots of room. Easy to install because of contractor installed it! Rated 5 out of 5 by Hopalong from great delivery time The medicine cabinet arrived so very promptly. We are waiting for our builder to begin the master bath project. I would like to comment again when the packaging is opened and the cabinet is installed. So Excellent on ordering and delivery! Rated 5 out of 5 by bb87 from High quality cabinet I am so pleased with how this cabinet looks in my newly remodeled bathroom. It is well built and BIG. The 4 black glass shelves look classy against the mirrored back and can be adjusted to any height (there are 14 placement options spaced about 2 inches apart). Our old medicine cabinet was a surface mount and I hated it. I insisted the new cabinet be recessed or we just get a regular mirror. Although it required moving pipes in the wall, we installed this recessed and I couldn't be happier. It doesn't even look like a cabinet - just a really nice mirror. Rated 5 out of 5 by anonamouse from BEST OPTION if you can't have recessed cabinets! We were disappointed to learn the contractor hadn't allowed for recessed cabinets in our modern master bath. We were looking at simple flat mirrors but the idea of the sink clutter was too unmodern to accept. I shopped long and hard for suitable surface-mount cabinets, most $1-2,000. I was very pleased to find these by Kohler, a trusted brand, and the mirrored side panel kits compensated well for the loss of the recessed look. I was concerned they would block or diminish our Kichler modern vanity lights, but once installed the result is fine. I ordered them ship to home and they came in less than a week. Ship to store would have been 2 weeks! Our installers mounted them easily, having only the usual struggles to find studs or choose drywall sleeves and make them level. It definitely took two people to handle the large cabinets and align them, but beyond that installation was simple. The interior is stunning with mirrors on the back and inside of the cabinet door. Rated 5 out of 5 by DonP from Quality cabinet Quality aluminum frame with glass door, back, and shelves. 5 inch depth makes for lots of storage. I mounted 4 units side by side to replace a large mirror. Was able to fasten together with spacers and screws purchased at local hardware. Only issue was one unit was received with broken shelves. Notified Home Depot and received a replacement cabinet within 10 days. Very satisfied with product and service.